Muthumudalige Pushpakumara - the Observer Schoolboy Cricketer of the Year 1999 - waits for the great day to get on field and play for Sri Lanka. CRICKET: Former Ananda all-rounder Muthumudalige Pushpakumara who won the Rs. 100,000 Player of the Tournament award in the 2007-2008 Premier League, earlier won the prestigious Observer Schoolboy Cricketer of the Year award 1999 for his fine performances. Born on 26th September 1981 in Colombo, Pushpakumara became the sixth Anandian to win the coveted award. He followed World Cup winning Captain Arjuna Ranatunga (twice) 1980-1982, Sanjeeva Ranatunga (1988) former Sri Lanka captain Marvan Atapattu (1990), and Thilan Samaraweera (twice) 1994-1995, Malith Gunatilleka in 2007. Muthumudalige fashioned out as a top all-rounder. He was a left-handed bat and right-arm off-spinner. He was able to fit in at any position in batting and he was a clever and match winning bowler too. He caused havoc among top cricketers in the schools and clubs. So, with the promise that he held out as a schoolboy at Ananda College it was no surprise that he would climb the ladder of success. With the success he gained in inter-school cricket, the three umpires associations who officiated in the Observer Schoolboy Cricketer of the Year Contest, picked him as Schoolboy Cricketer of the Year in 1999. Muthumudalige set a record. Besides winning the main award he had a bagful of awards coming his way for the wonderful performances with both bat and ball in the 1999 season. He was also picked as the Best Bowler, Best All-rounder and Best Fielder in the All-Island Contest. He scored 650 runs in 1999 with an unbeaten 122 against St.Sebastian’s College as his highest. He captured 63 wickets with his off-spinners and held 26 catches. He had plenty of success at inter-school cricket season in the year 2000 too. 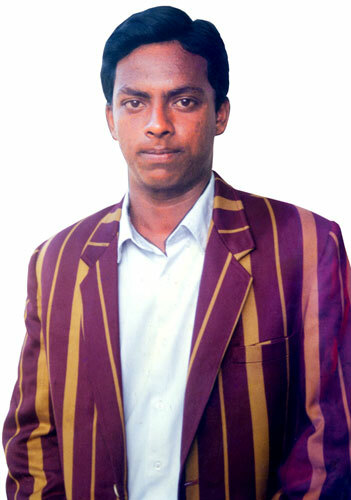 Muthumudalige Pushpakumara was also selected as the Most Outstanding Sportsman of the Year at the Sri Lanka Schools Colours Awards Ceremony held in December 2000 at the BMICH. Pushpakumara received yet another top award on offer_that of the ‘Prince of Wales’ Trophy on conclusion of the inter-school under-19 tournament organised and conducted by Sri Lanka Schools Cricket Association. He was an automatic choice for this award, following his fine showing on the field throughout the year 2000. The all-rounder played a significant role during the Youth World Cup Tournament in Colombo where Sri Lanka were runners-up. The Prince of Wales’ award was handed over to him by Linda Duffield, the British High Commissioner in Sri Lanka. The British High Commissioner said England and Sri Lanka have had a good cricketing relationship and this was the reason Prince Charles during his visit to Sri Lanka in 1998 to participate in the country’s 50th Independence Day Celebrations, decided to make an annual award to the most outstanding schoolboy cricketer of the year. In January 2000, Muthumudalige Pushpakumara at 18 years was selected for Sri Lanka Test tour of Pakistan. He was the ‘baby’ of the side. The team was led by Sanath Jayasuriya and included Mahela Jayawardena, Marvan Atapattu, Romesh Kaluwitharana, Russel Arnold, T. M. Dilshan, Chamara Silva, Pramodaya Wickremasinghe, Chaminda Vaas, Nuwan Soysa, Ravindra Pushpakumara, Indika Gallage, Muthumudalige Pushpakumara. However, Pushpakumara never played a match. One of the brightest prospects to emerge in recent years he was around the third schoolboy to be named in the national squad after former captain Arjuna Ranatunga and former Royalist Roshan Jurangpathy. He impressed with the bat and ball in two warm-up matches against England in March 2001, scoring a half century and being among the wickets. Pushpakumara has played for major teams_Basnahira North, BCCSL Academy XI, Colombo District CA, Colts CC, John Keells Group, Sri Lanka ‘A’, Sri Lanka Board President’s XI, Sri Lanka Board under-23, Sri Lanka Board XI, SL Cricket President’s XI, Sri Lanka Emerging Team, Sri Lanka under-19s, Tamil Union, Uva Province, Western Province. Muthumudalige Pushpakumara, the Tamil Union all-rounder has won the Rs. 100,000 Player of the Tournament award in the recently concluded 2007/2008 Premier League. In his first season with Tamil Union, Pushpakumara played a vital role and helped the club to take third place behind SSC and Moors SC with fine allround contributions of 590 runs at 42.14, including a century and four fifties and 34 wickets at 24.02. When Pushpakumara, 26 years, burst into the Sri Lanka under-19 team eight years ago, he was considered a future prospect for the national side. But in the following years Pushpakumara hardly made the grade with performances not flowing and he had to play the waiting game. Joining Tamil Union from Colts, a change has come about Pushpakumara’s outlook and he is blossoming into the allrounder he originally promised to be. The prestigious Cricketer of the Year award which carries prize money worth Rs. 250,000 has yet to be decided by Sri Lanka Cricket. Pushpakumara toured Pakistan and South Africa without being given a chance in the Test side, but is a fine allrounder, who bowls steady off-spin. Former captain Pushpakumara’s best performance in his cricketing career was when he stroked a beautiful century (134) which included 14 boundaries and a six in one ‘Test’ against England in the under-19 Sri Lanka team tour of England in 2006. Pushpakumara, the gifted allrounder who has performed well in the domestic tournaments is determined to make his way to the Sri Lanka team to play in the Test matches in the future.